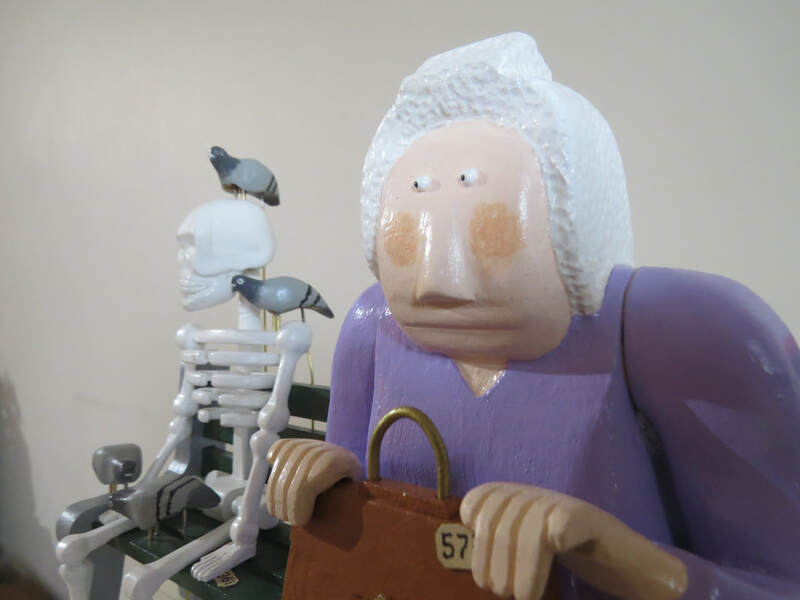 The Story of "The Bus Stop"
You may remember Eleanor from another automata project "An Uphill Battle". She has recovered nicely for her hip replacement and is back to her old self moving about freely. 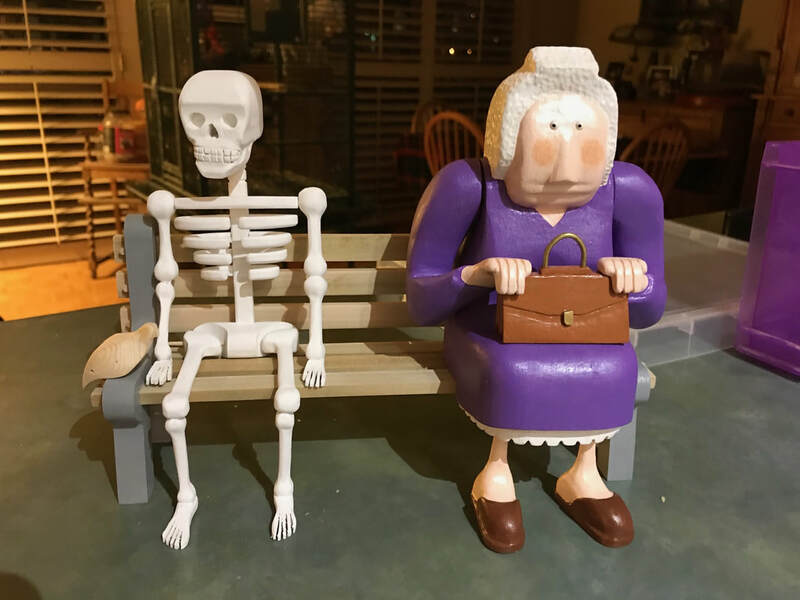 With her friend Maude's directions Eleanor is taking the bus to the new seniors centre but she has unwittingly found herself with a peculiar benchmate as she waits for the bus. It seems that bus route No. 36 has been discontinued for sometime, and an unaware transit patron expired during the wait. 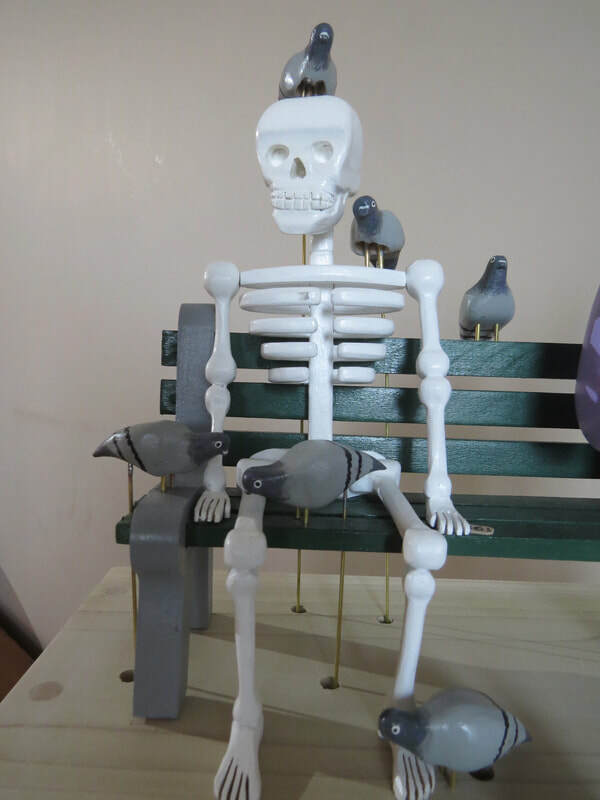 In a strange freak of nature a small flock of carniverous pidgeons are stripping the skeleton where it sits. It's an uncomfortable situation with a pidgeon eying Eleanor suspiciously. The question is what part of human nature causes to hopefully wait for something that repeatedly doesn't seem to occur. Did our friend just fall asleep and expire? Did the disappointment lead to a deep depression that caused them to give up on life? We will never know. What is with carnivorous pigeons anyway? If the ever appeared in St. Peters Square it could be disastrous! Who says the world isn't a strange place. Not much left of the route 36 patron! Eleanor clutches her No. 57 ticket anxiously waiting her escape from this uncomfortable situation. Before pigeons and a lighter purple topcoat.